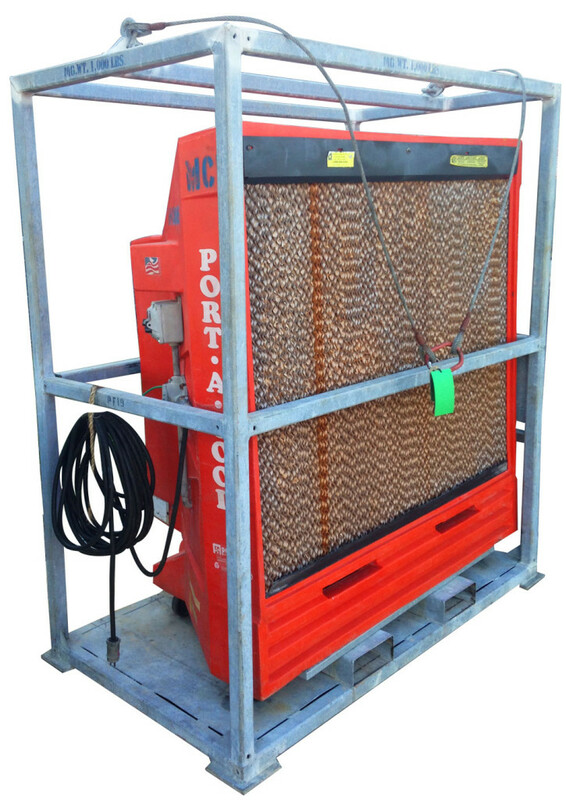 Portable ventilators and air coolers for confined space or high temperature work areas, offshore and inland. Positive or negative airflow for confined spaces that require a powerhouse ventilator the VAF series portable ventilators can handle your most demanding industrial needs. The 36" Belt Drive Hazardous Location Port-A-Cool one-piece housing is built with rugged molded Polyethylene plastic for absolute protection from corrosion or rust and is both ETL & UL approved. This unit comes with 4" solid non-metallic caster wheels and ball bearings for easy movement and is built with exact specifications for facilities that require hazardous location equipment. The powerful hazardous location 1/2 HP TEFC, 110 VAC 8.4/5.2A, 60 Hz., Class 1, Div 1, Groups C & D single speed fan motor produces 9,600 CFM output to cool up to 2,500 sq.ft. areas 20° or more! The 1/4 HP TEFC 110 or 220 VAC 4.4/2.8A 60 Hz., Class 1, Groups C & D pump disperses the water from the 32 gallon capacity internal reservoir throughout the resin treated corrugated fiber board KÜÜL cooling pads. Each of the 5 pads have 37.5° fluted angles for maximum cooling efficiency even in high humid areas. The rugged conduit box, switches and wiring are all protected, along with the ridged conduit, hazardous location couplings and flexible cord with Class 1, Group C & D fittings. This unit is supplied with a 50 ft. power cord with no plug so that each user has a choice of plug variations. The water supply is obtained by simply connecting a standard 3/4" garden hose to the unit and is regulated by a float valve inside the internal reservoir. The fan blades are made of Polypropylene on a Nylon hub to prevent rust or corrosion. Operational cost is only pennies per day, a fraction of the cost of standard air-conditioning. Environmentally friendly since the cooling is accomplished naturally through the process of evaporation without the use of harmful refrigerants.